As a supervisor, you can listen in on active calls handled by agents you supervise. You can access and play back call recordings from the Playback tab. With the ability to filter and search, you can get to the call recording you are looking for quickly. 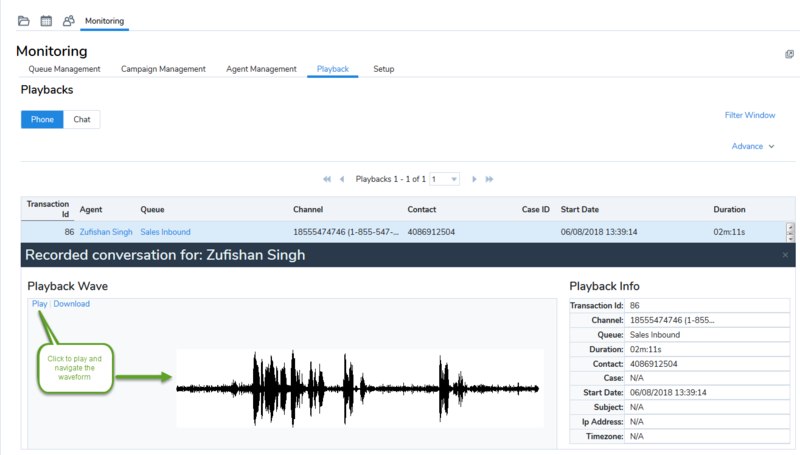 Call recordings are displayed in graphical waveform to quickly view and navigate to specific areas of recorded conversation. The advanced search allows you to look up recordings based on transaction ID, contact (phone number), start date, and duration. For example, you can search for all recordings specific to a customer in the last week. Click the Playback tab in the Monitoring window. A list of all call recordings shows. Click Filter to specify the filtering parameters, such as agents, queues, or channels. To search, click Search and look up by transaction ID, contact (phone number), start date, and duration. For example, you can search for all recordings specific to a customer in the last week. Click the desired recording for a waveform display. You can click on the waveform and navigate easily. Note: Mouse-driven waveform display requires HTML5-compliant browsers such as Chrome and Firefox. Internet Explorer does not support browser-embedded playback.